This is a fairly strong acid. Additional steps of proton loss are possible; Reaction (10-20) represents a second step. More highly polymerized species also form, and eventually some water molecules as well as H+ ions are split out. The exact composition of the equilibrium product(s) depends on pH and total iron content, but frequently the neutral, highly polymerized insoluble substance called ferric hydroxide is produced. The formula Fe(OH)3 is often used for this precipitate. The fresh material has an uncertain structure, but on aging is mainly FeO(OH). This does not form discrete molecules but involves O and OH groups bridging to other Fe(III) ions. The structurally indistinct nature of the fresh Fe(III) hydrolysis products leads to precipitates of highly gelatinous and often colloidal nature. As a result of hydrolysis reactions such as the foregoing, Fe(III) salts are virtually insoluble in waters with a pH near neutrality; indeed, iron is present mostly as hydroxo complexes at pH 4. Fe(II), on the other hand, does not form these complexes significantly until about pH 10 and is soluble near neutrality. At the pE value of air-saturated water, 12.5, log [Fe(II)] = -16.5, and the concentration of Fe(II) under these conditions is insignificant. Indeed, in the absence of special conditions for its stabilization, reasonable concentrations of Fe(II) can be formed only under anaerobic conditions. At pH 8.1, the concentration of soluble ferric iron is about 3 x 10"11 M. The true dissolved Fe(III) concentration in natural waters such as the ocean may be increased by complexation, and colloidal material may be present. However, values are sufficiently low that iron is the limiting nutrient for plankton growth in at least some parts of the ocean, especially those far from land, where windblown dust does not provide a regular input. It has been shown by experiment that addition of a soluble iron salt to a large test patch of ocean increases plankton growth considerably,15 and this approach is being proposed as a way of reducing carbon dioxide concentrations in the atmosphere to control the greenhouse effect. The principle underlying this approach is that increased plankton growth will reduce the concentration of dissolved CO2, which in turn will result in dissolution of more from the atmosphere to replace it. Although this will be regenerated as the plankton die and decompose, some fraction of the plankton should sink and be incorporated into sediments. Some calculations suggest that up to 20% of the anthropogenic CO2 might be taken up by iron fertilization of unproductive oceans, particularly in the Antarctic regions. Many uncertainties remain unresolved. Among these are the fraction of plankton actually trapped in sediments, the frequency with which the fertilization would have to be applied, the cost of the distribution of the iron compound, the atmospheric effects of methyl sulfide production from the increased plankton growth, the effects on low oxygen regions of the deep ocean from decomposing plankton (Will large regions become anaerobic? Will products of anaerobic decomposition cause other environmental problems? ), and possible effects on the food chain. 15R. Rawls, Ironing the ocean, Chem. Eng. News, 74, 40 (Nov. 4, 1996). The research is reported in Nature, 383, 495, 508, 511, and 513 (1996). See S. W. Chisholm, P. G. Falkowski, and J. J. Cullen, "Dis-Crediting Ocean, Fertilization," Science, 294, 309 (2001) for a more recent discussion. surfaces. Under these conditions a more or less stable suspension or colloid results. It is not uncommon for the particles of ferric hydroxide to be extremely small and not easily distinguished from material in true solution. 0ne mole of FeS2 eventually gives 4 mol of H30+: two from oxidation of S2~ and two from the oxidation of iron. This process deposits insoluble ferric hydroxide that coats stream beds, as well as contributing to the acidity. Since the formation of Fe(III) from Fe(II) is slow, this may take place over a considerable length of the stream. The oxidation of reduced forms of sulfur by Fe(III) can also take place with other metal sulfides that may be present, including those of toxic heavy metals such as lead or cadmium. Consequently, the acid mine liquids can contain important concentrations of these elements. Much of the heavy metal content may be transferred to the sediments by adsorption on the ferric hydroxide particles as they precipitate. The role of bacterial processes in these apparently inorganic reactions is very significant. Various thiobacilli, for example, Thiobacillus ferrooxidans, can oxidize inorganic sulfides to sulfate as a source of energy. Besides iron, a variety of other metal sulfides, including those of copper, nickel, arsenic, and zinc, can be used. The bacteria are in a sense a catalyst for these reactions, but unlike true catalysts, which remain unchanged in the process, the bacteria grow. Bacteria can also gain energy from the oxidation of Fe(II) to Fe(III). We may represent the stability relationships in a system such as that of iron as a function of pE (or Eh; see Section 9.4) and pH diagrammatically. Figure 10-13, which illustrates this, shows that iron metal will be oxidized (will rust) unless the oxygen content is low enough to give a pE below —10. 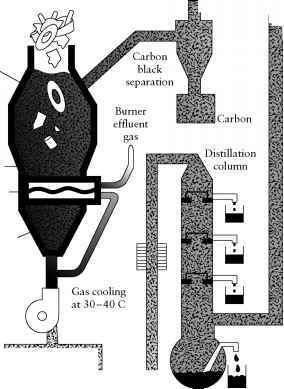 The ferrous ion is soluble in slightly acidic reducing solutions, but the carbonate will precipitate near neutrality if CO2 is present. Fe(III) is soluble only at pH values below 4 under oxidizing conditions. Under environmental conditions, other components, especially carbonate and sulfide phases, might also be involved in the equilibria. Examples may be found in the reference given in the figure caption. 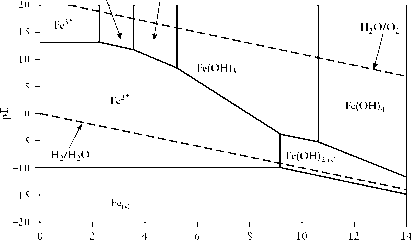 FIGURE 10-13 A simplified Pourbaix (predominance area) diagram for iron in the presence of water and oxygen. Redrawn from J. G. Farmer and M. C. Graham, in R. M. Harrison, ed., Understanding Our Environment. Cambridge: Royal Society of Chemistry. Copyright © 1999. Used by permission of The Royal Society of Chemistry. may have acted to regulate the O2 pressure in the primitive atmosphere. Iron is a very common constituent of fresh waters, where it is sometimes present in the Fe(III) state either as colloidal material or in solution as a complex with organic material. In large amounts it imparts a characteristic rust color. In some groundwaters that are anaerobic, Fe(II) may be present, and since compounds of this oxidation state are soluble, comparatively high concentrations can be reached (often in the range of 1-10mg/liter). These Fe(II) compounds of course are oxidized under ordinary conditions to Fe(III) and ultimately are the source of the colloidal material. Although this oxidation of Fe(II) upon aeration may be moderately slow, significant occurrence of iron in this oxidation state in surface waters requires either the presence of organic material or a high acidity (see Figure 10-13), and in either case is suggestive of pollution.